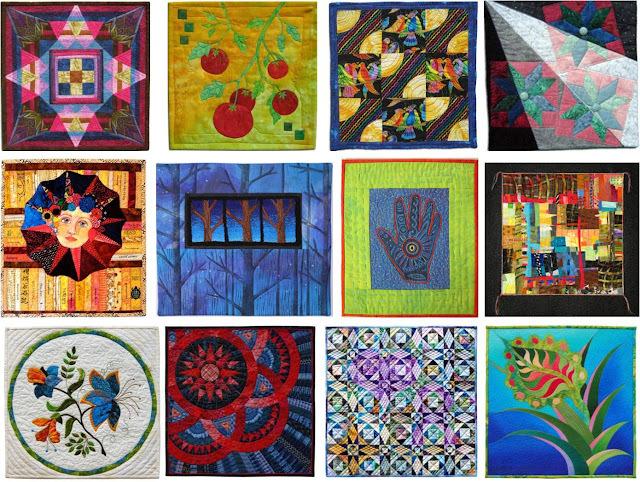 November - December : Quilt Shows, Exhibits, and Raffles ! Row 1 above, L-R: Art Quilts XV, Needleplay, at the Chandler Center for the Arts (Nov. 5- Jan 15); Cream of the Cloth, at the San Jose Quilt Museum (Nov 16 - Jan 30); Sew New Contemporary Artist Quilts, at the Osilas Gallery, Concordia College (Nov 4-Dec 11). Row 2: Quilts = Art = Quilts, at the Schweinfurth Memorial Art Center (on now, until Jan 9); The 29th Annual Capital City Quilt Show at the Museum of Florida History (on now, until Jan 23); Red and Green Extraordinaire, at the Rocky Mountain Quilt Museum (Nov 2 - Jan 29). 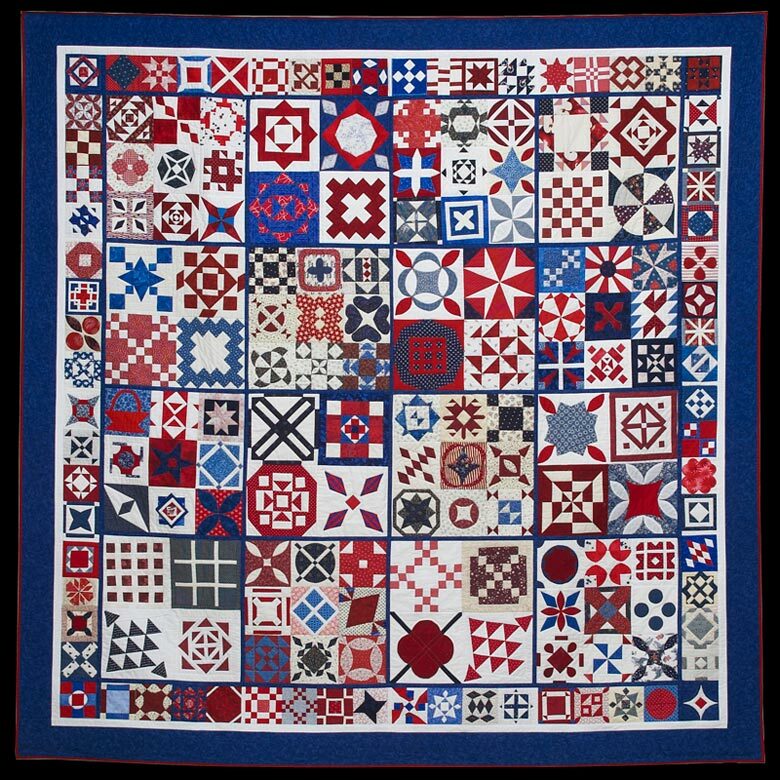 Also see Marseille, White Corded Quilting, at the International Quilt Study Center & Museum (Nov 13- May 22), Superstars: Quilts from the American Folk Art Museum (Nov 16, 2010-Sept 25, 2011); and the Australia Wide Two art quilt exhibit, at the Fairfield City Museum and Gallery in New South Wales (on now, until December 5). Row 1 above: "New from Old" contest, at the Alliance for American Quilts, on now, until Dec 6. 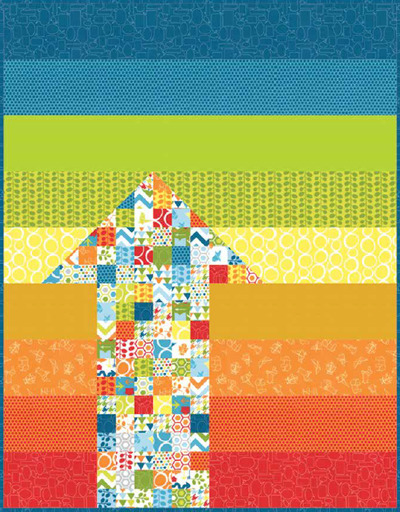 Row 2: The 3rd Annual High Fiber Under Five Benefit Art Sale, Nov 5-6, at the San Jose Museum of Quilts and Textiles. 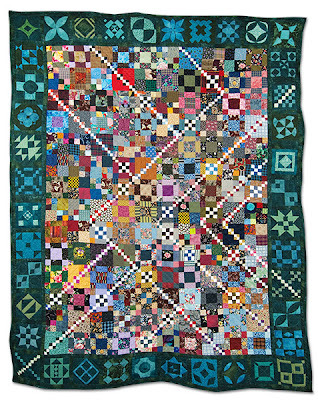 Row 3: 2010 World Series Quilt Challenge, Alzheimer's Art Quilt Initiative, Nov 1-10.
International quilt shows: International Quilt Festival/Houston (Nov. 4-7, Texas); World Quilt Show (Nov. 12-14, Florida). 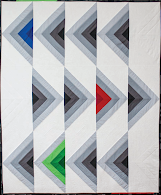 Opportunity Quilts, Shows, and Festivals ! Row 1, L-R: Needlechasers Quilt Guild show (Dec. 3-4, Maryland); Roseville Quilters Guild raffle only (December drawing); 15th Annual Quilt Auction, Friends of Alaska CASA (Nov. 20, Alaska); International Quilt Association, raffle (November 7 drawing, at the International Quilt Festival, Houston). 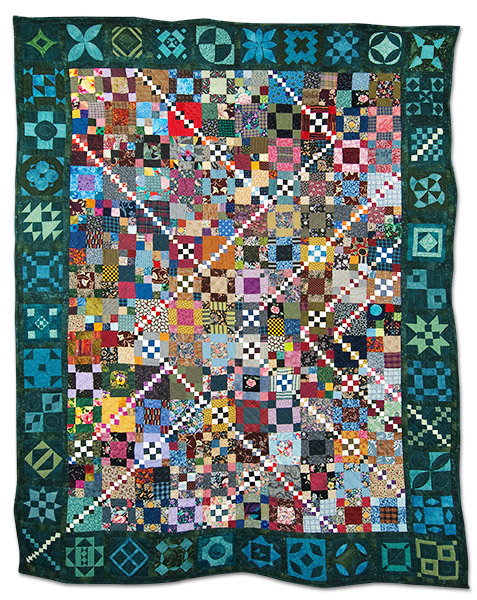 Row 2: Block Party Quilters Club 2010 show (Nov. 5-7, Washington); Rocky Mountain Quilt Museum raffle (December drawing); Calico Christmas, the Auckland Patchworkers & Quilters Guild show (Nov. 5-7, New Zealand); Country Road Quilters show (Nov 5-6, Florida). 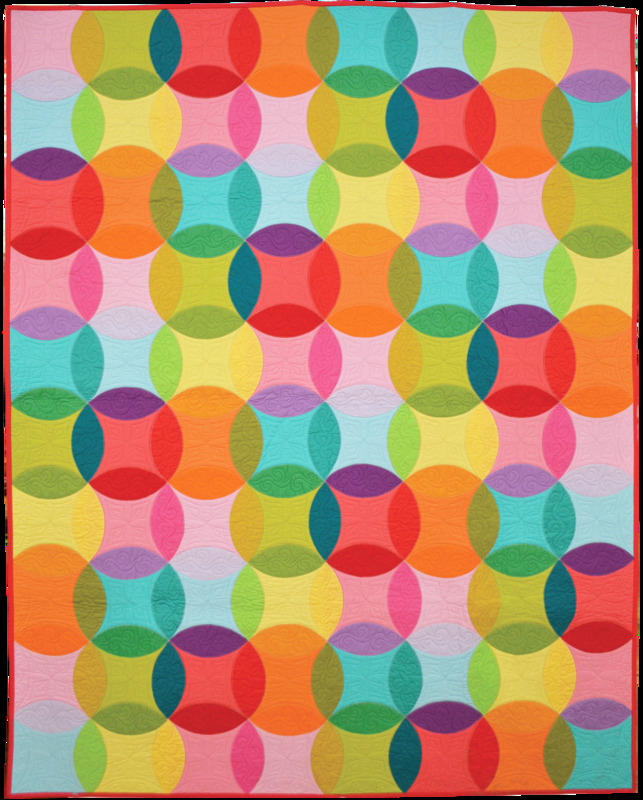 Row 3: Sun Country Quilters, raffle only (December drawing); Pioneer Quilters Guild show (Nov. 5-6 , California); Tokay Stitch 'N' Quilt Guild show (Nov. 6-7, California); Orange Grove Quilters Guild show (Nov. 5-6, California). 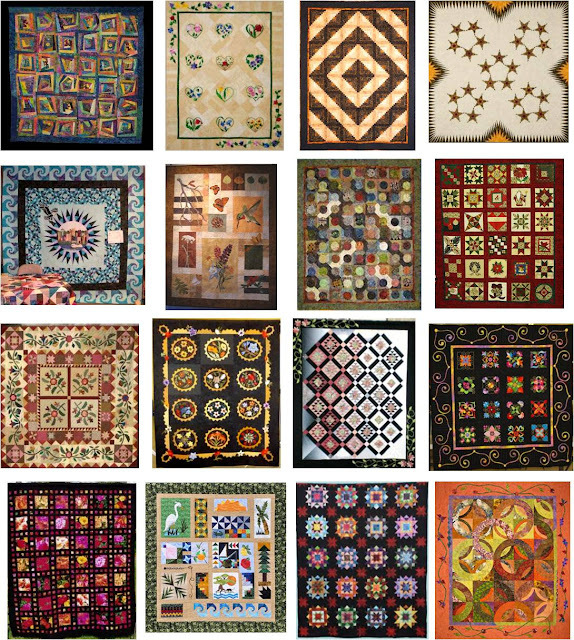 Row 4: North County Quilters' Association show & auction (Nov. 6, California; raffle drawing Dec.20); Cypress Creek Quilters Guild show and auction (Nov. 6, Florida); Village Square Quilters show (Nov. 13-14, New York); River City Quilters' Guild show (Nov. 19-21, California). 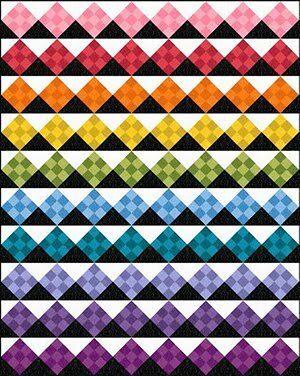 More quilt shows and festivals: East Coast Quilters Alliance, A Quilters Gathering (Nov 4-7, New Hampshire); Quilt and Craft Fair (Nov. 4-7 , Adelaide, Australia); Lees Summit Quilters Guild (Nov 5-6, Missouri); Autumn Quilt Festival (Nov 5-7, Cambridge, UK); The Belfast Creative Crafts Show (Nov 11-13, Ireland); 10th Annual Quilts & Tea Festival (Nov. 12-13, Florida); Variable Star Quilters show (Nov. 12-13, Pennsylvania); Arkansas Quilters Guild show (November 12-13, Arkansas); Rim Country Quilt Roundup (Nov 12-14, Arizona); Reflections of Nature Quilt Show (Nov 13-14, Ohio); Ole Time Christmas Quilt, Craft and Fine Arts Show (Nov 19-20, Summit Hill Heritage Center, Pennsylvania); Celebration of Crafts and Quilt Exhibit (Nov 19-20, Oklahoma); The Knitting and Stitching Show 2010 (Nov 28-30, Harrogate, UK); Dickens of a Christmas Quilt Show (Dec 2-5, Wisconsin). 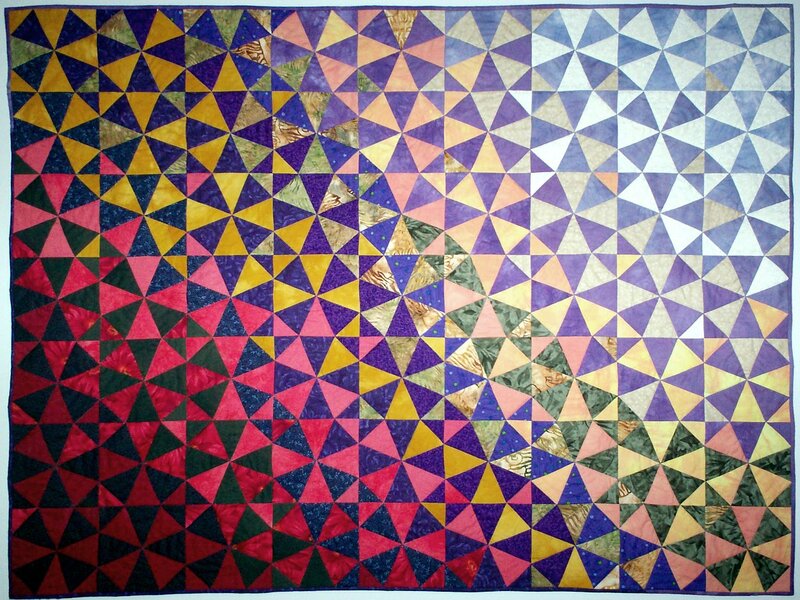 When it comes to quilt design, we are drawn to dimensionality (such as attic windows and tumbling blocks), color, and movement. In design, movement is often created by curves, or the illusion of curves. 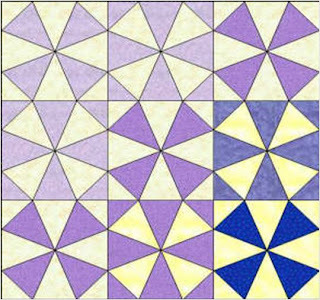 Today we're discussing two tessellating patterns that display the illusion of curves but are made with straight-seam piecing (the best of both worlds !) 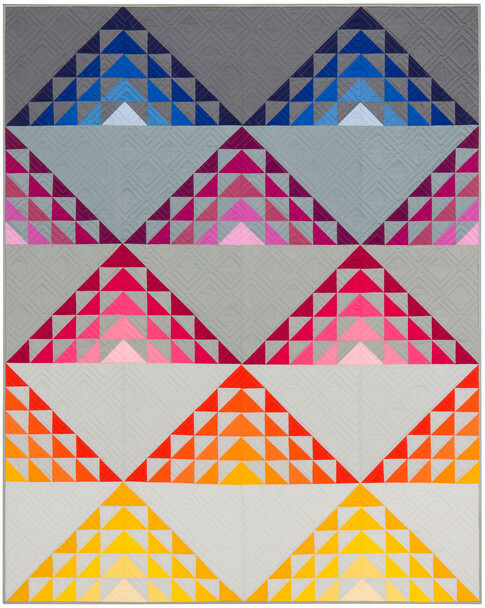 We've chosen two stunning modern quilts to illustrate the design principles. 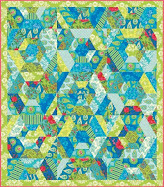 We first saw the dazzling "Reel Starz" at the Road to California in January, 2010 and we fell in love with the quilt. 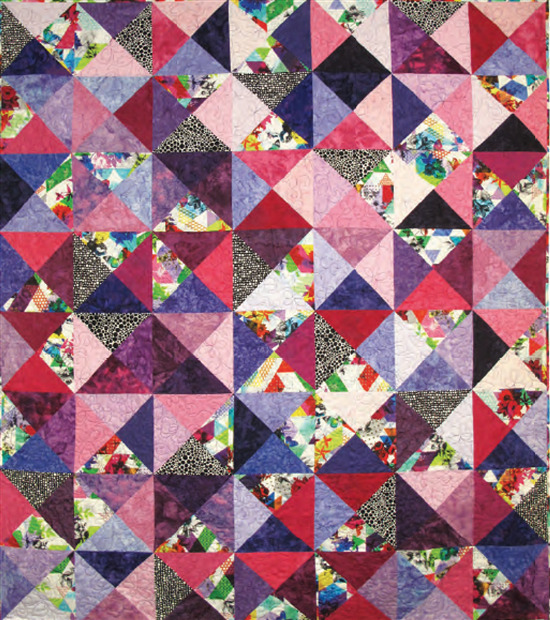 Gail Hansen used hundreds of luscious fabrics to create a color wash, which moves from purple and magenta to indigo, blue, aqua, and green. 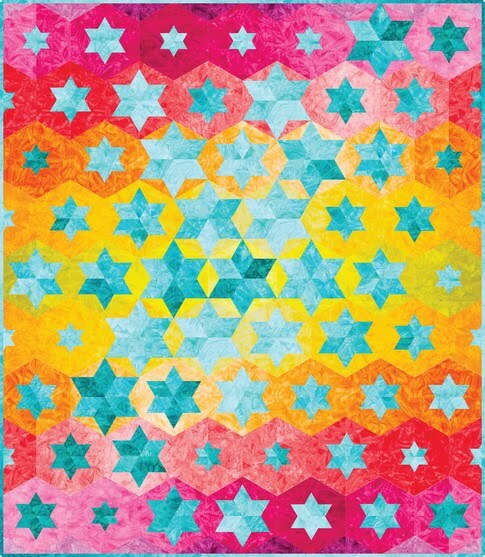 The white, ivory and cream stars appear to hover above the darker background, creating a three-dimensional effect. 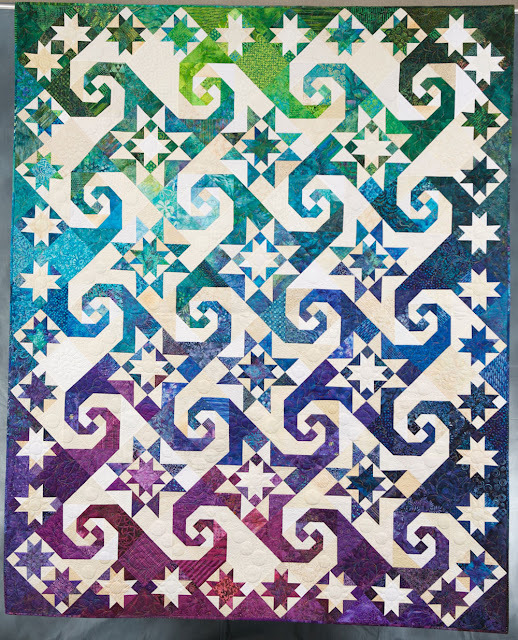 "Reel Starz" won the honorable mention award in the traditional, large, pieced category at Road to California; it was also juried into the 2010 Pacific International Quilt Festival. 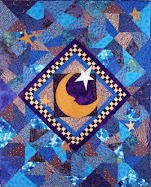 In the photo shown below you also can see the quilting, which was done by Judy Woodworth (Gering, NE). 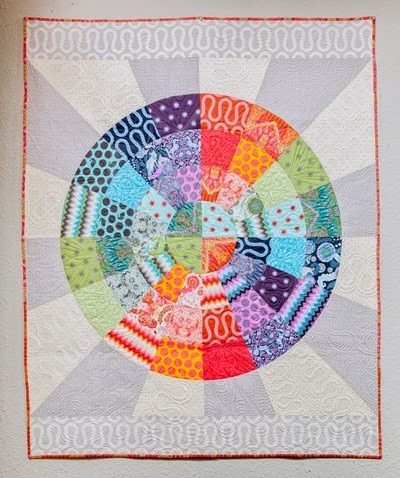 She used beautiful variegated thread in the colored parts of the quilt and then added interest in the white/cream areas with circles or bubbles somewhat randomly placed. 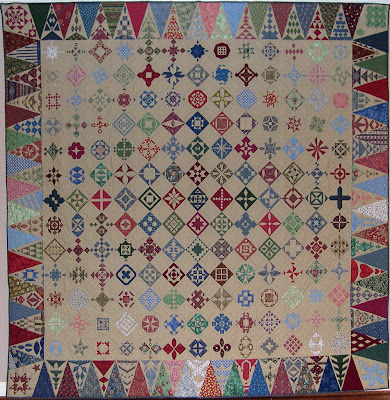 Gail Hansen began working on "Reel Starz" at a family quilt retreat in 2008, and the quilt was completed in 2009. 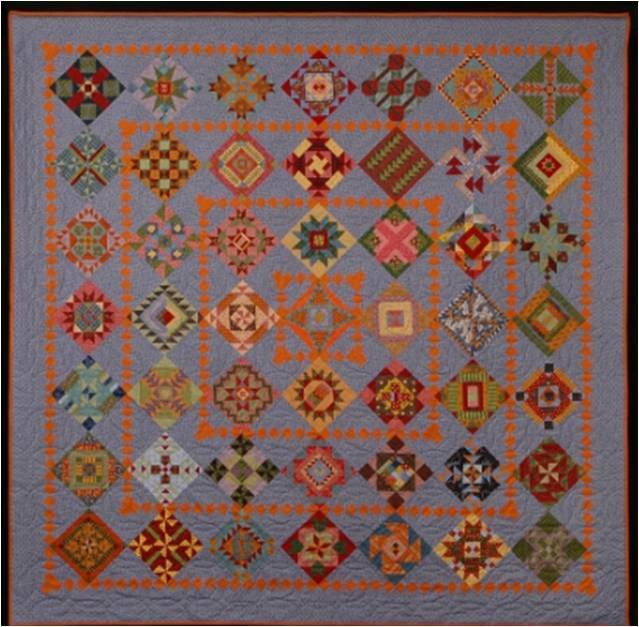 The family quilt retreat has become a tradition in which Gail, her mother, and 2 sisters meet in Nebraska to work on a predetermined project - each on her own - for 3 - 5 days. In her artist's statement, Gail says: "Reel Starz exemplifies my love of color and family." 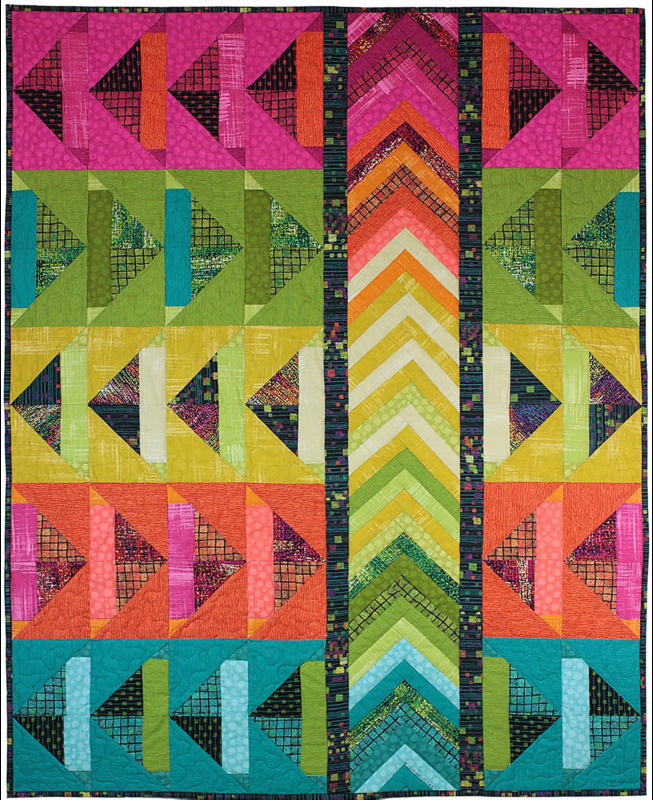 Her family celebrated their 13th annual "Quiltathon" this past summer !" The core snail's trail block in "Reel Starz" is highlighted below. 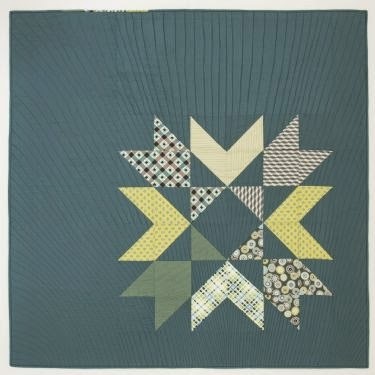 With respect to naming: Gail Hansen's "Reel Starz" was based on Shakespeare in the Park by Judy Martin, which combines Virginia Reel with Rising Star and Evening Star blocks. 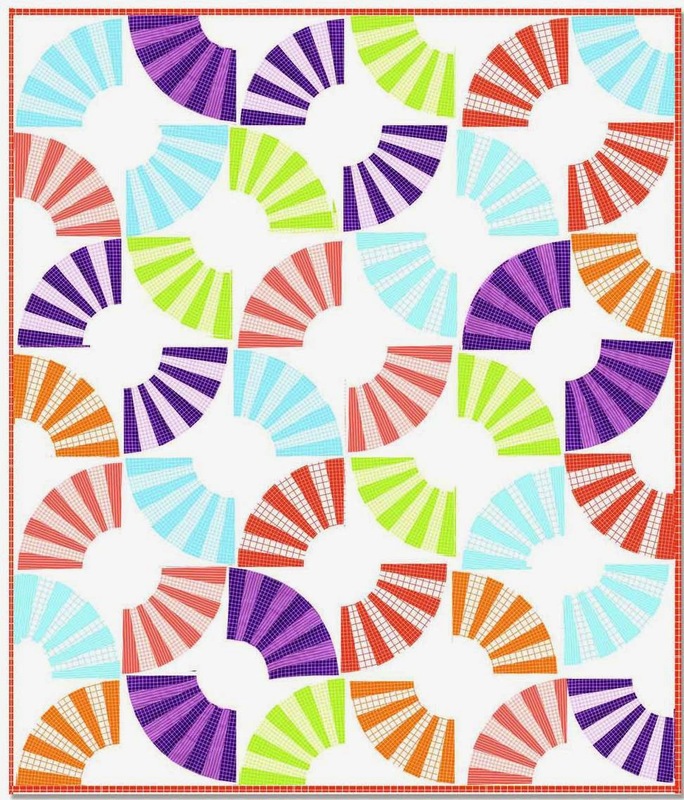 Most of us would recognize the block shown above as Snail's Trail, but it is also known in The Quilt Index as Virginia Reel, and occasionally as Monkey Wrench. 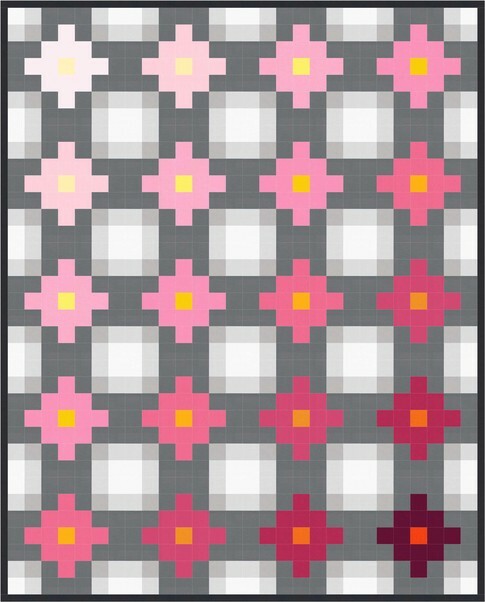 Note that a similar pattern with a small 4-patch in the middle is known by the same names. To add to the complex nomenclature, the names Monkey Wrench and Virginia Reel have been used to describe several other, totally different blocks* ! We loved reading Jen's descriptions of her design process at jentucker.blogspot.com. 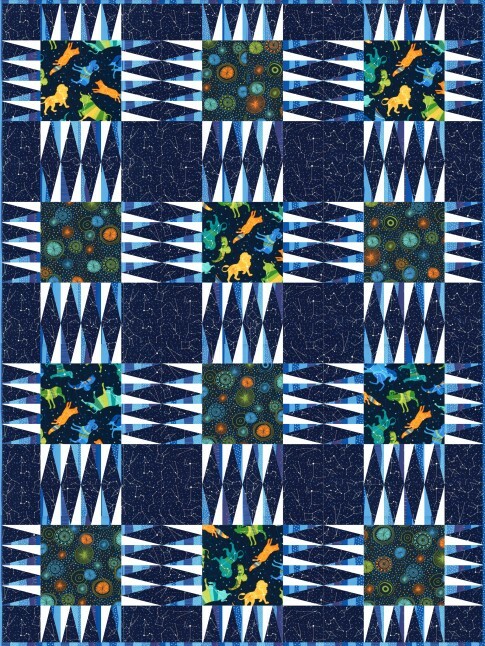 Here are her individual posts about Organic Kaleidoscope: initial design on EQ; selecting fabrics; cutting triangles; laying out on the design wall; discussing (in comments) how many seams it takes to make a quilt out of 756 triangles; debating (again in comments) which orientation the quilt should have; final tweaks to the layout; constructing the top; and quilting. Image credits and additional resources: Images are shown with the generous permission of the artists. 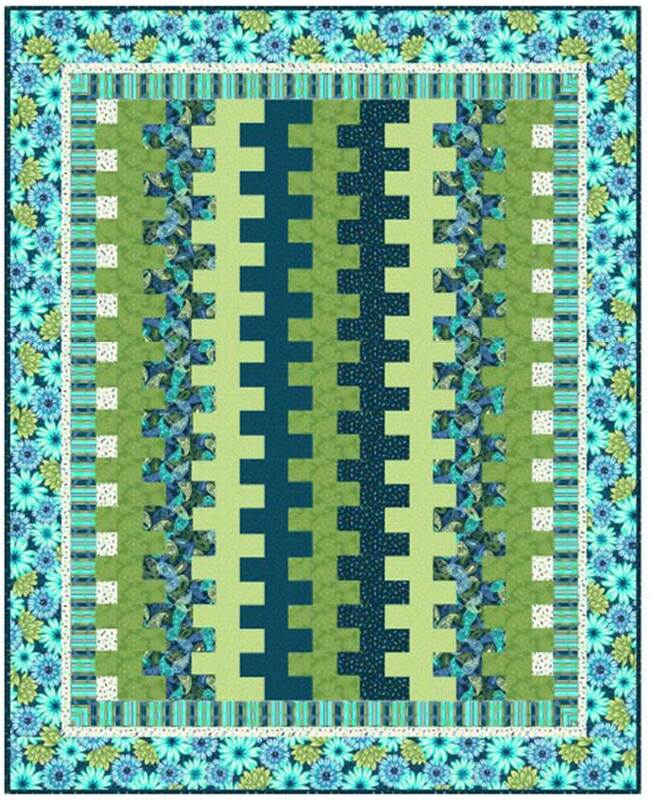 Snail's Trail/Virginia Reel: *For block nomenclature, see Jinny Beyer, The Quilter's Album of Patchwork Patterns: 4050 Pieced Blocks for Quilters , p. 342. 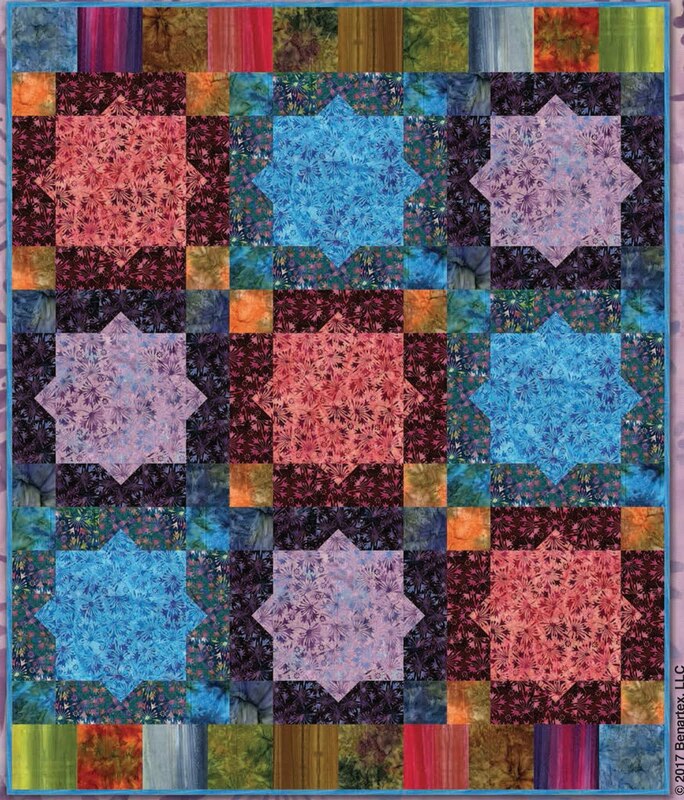 Kaleidoscope: A variety of different kaleidoscope blocks can be found in Jinny Beyer's book. 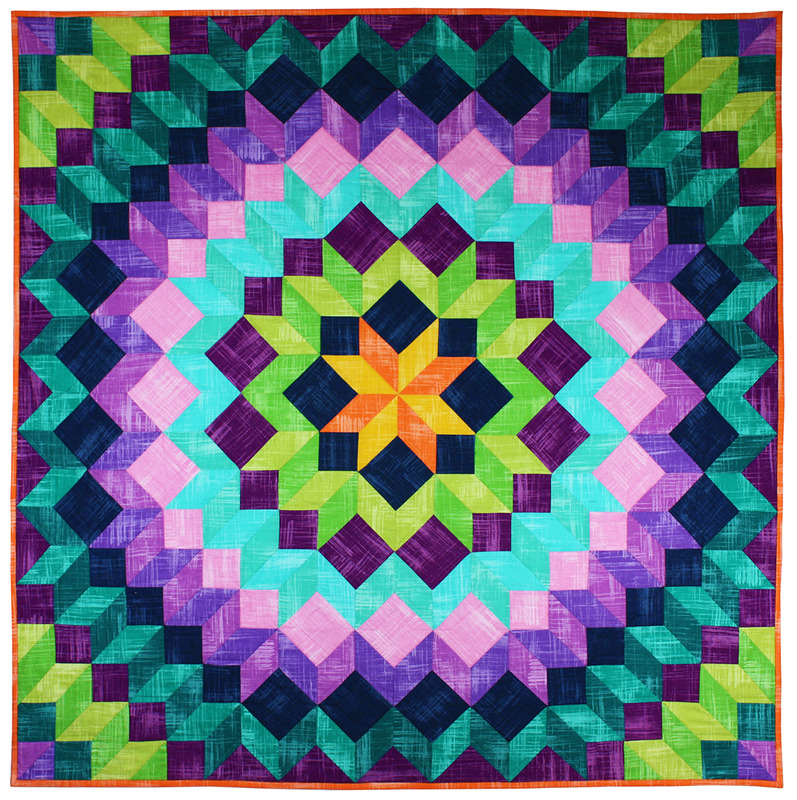 Quilts based on the classic block shown in "Organic Kaleidoscope" can also be found in Kaleidoscope ABCs: 14 Step-by-Step Patterns. In recent years, the term "kaleidoscope quilt" has been applied to quilts that mimic the appearance of repeating patterns as seen through a kaleidoscope. 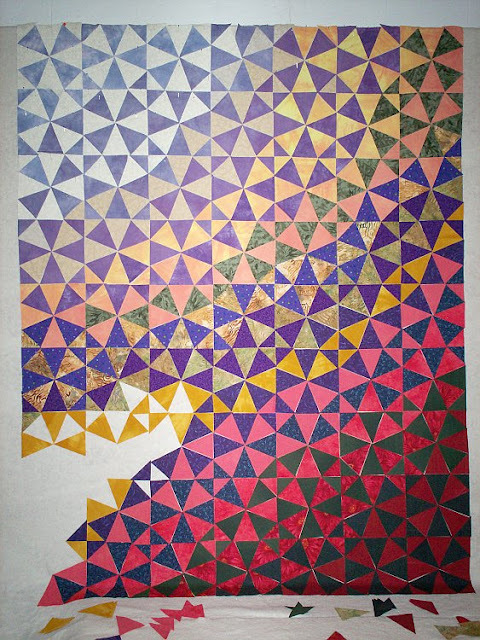 Such "kaleidoscopic" designs require a set of identical pieces cut from a print fabric to make hexagons, octagons, or more complex polygons. 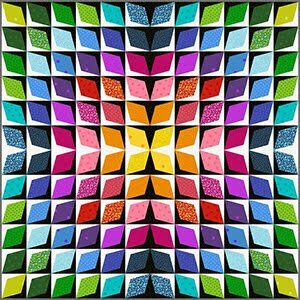 In the latter case, the design focus is on the repeating fabric pattern, rather than on the circular designs formed by the tiled blocks. 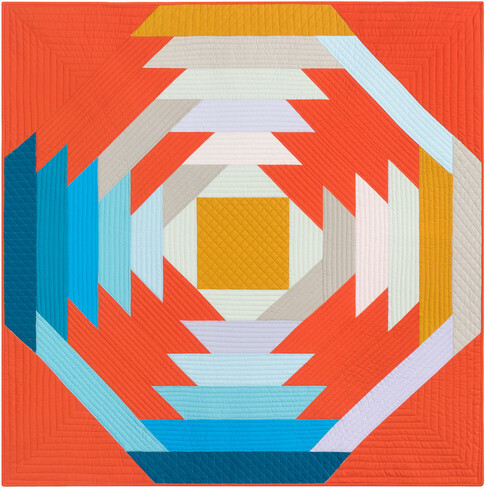 See for example Kaleidoscopes and Quilts by Paula Nadelstern, Magic Stack-n-Whack Quilts by Bethany Reynolds, and One-Block Wonders: One Fabric, One Shape, One-of-a-Kind Quilts by Maxine Rosenthal. Anyone who spends the spring and summer carefully tending crops or working on a farm must surely be pleased when the plants bear fruit that is ripe for picking. This is the joy of harvest season and the feeling of well-being and accomplishment. 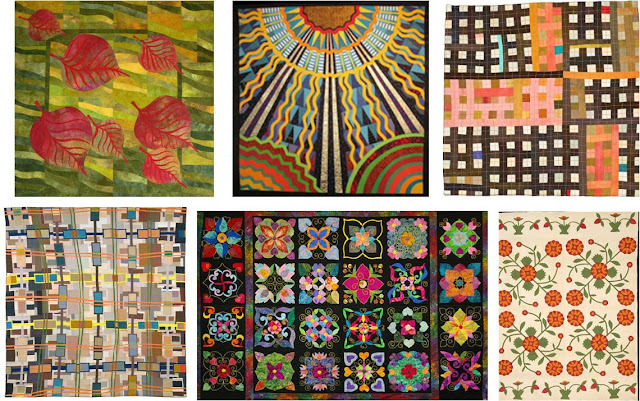 No wonder that our quilting foremothers used the theme of harvest in their creations as a way of celebrating the bounty of life. With this post, we are beginning a multi-part series on quilts with images of pumpkins, pears, apples, and other harvest items. 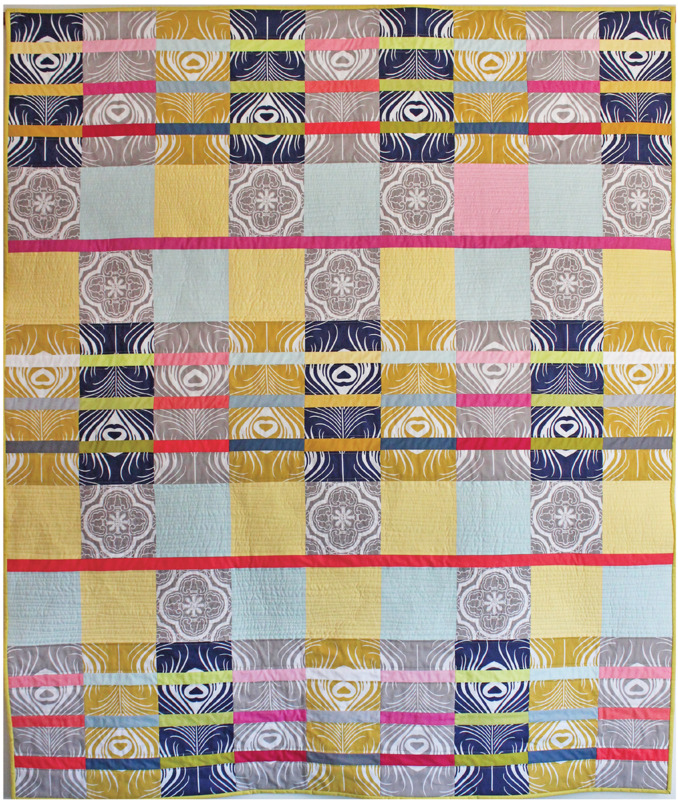 Join us as we browse through lovely quilts with colors and patterns as richly varied as all the goodness of nature. 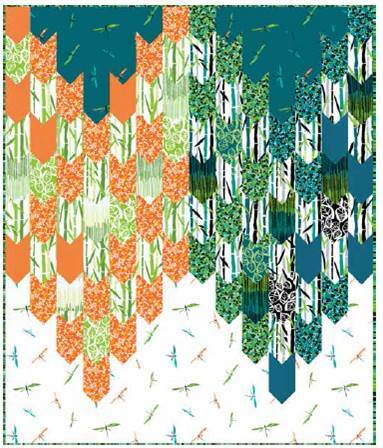 We had such a wonderful time featuring Frieda Anderson's work on our Dances With Nature blog post, that we wanted to bring back her vibrant creations for an encore. Here's "Pumpkin," done in a sumptuous, radiant orange, cradled gently in a bed of protective sage green and pale olive leaves. 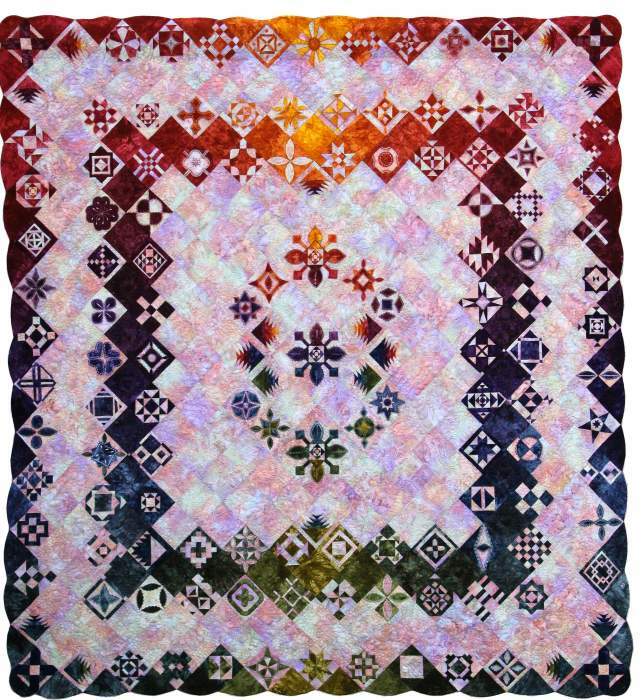 The vines reach out in whimsical spirals announcing to us that the pumpkin is at its peak of growth.The restful background which elegantly fades to purple, then burgundy, gives this quilt both a feeling of joy and serenity. 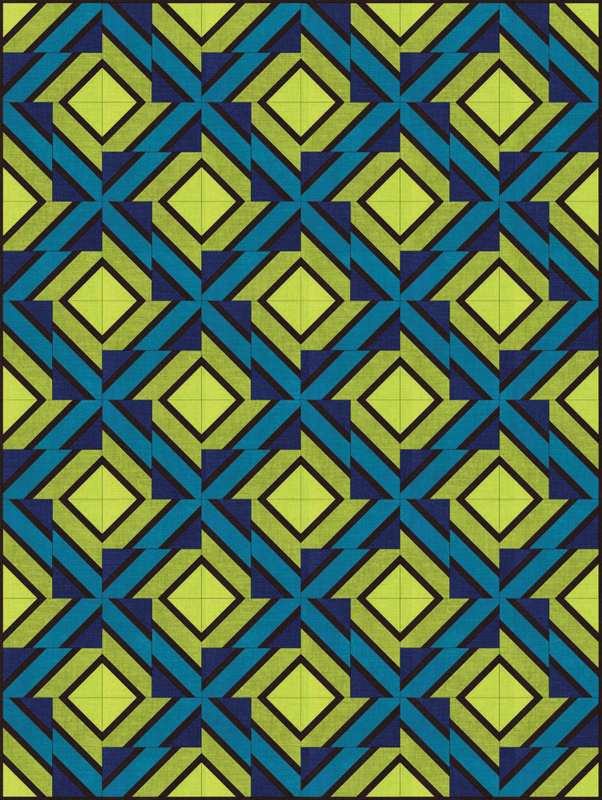 If you click on the image to expand it, you'll be able to see some of the quilting which perfectly complements the pattern. Notice Frieda's flawlessly perfect perspective, as she displays a family of pumpkins from various angles of repose. The stately pumpkins are beautifully contrasted with the sunny green leaves turning out and up to greet the world. 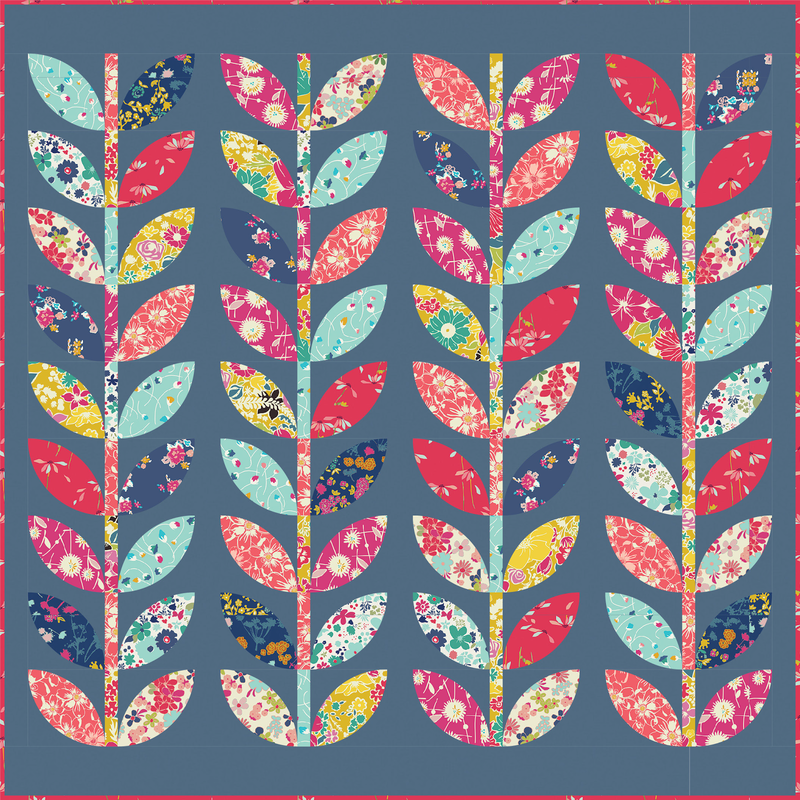 One of Frieda's many talents is creating fabric colors with gorgeous, subtle streaks and highlights which really make her background and foregrounds glow as if they are lighted from behind. 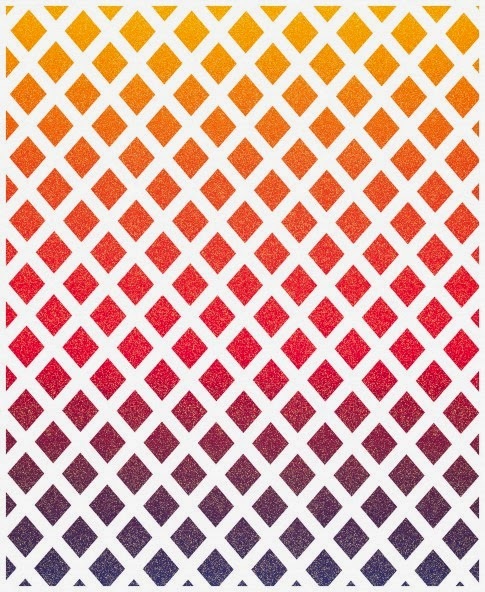 Her gradations of color are delicious eye-candy, which provide so much fascinating visual interest. 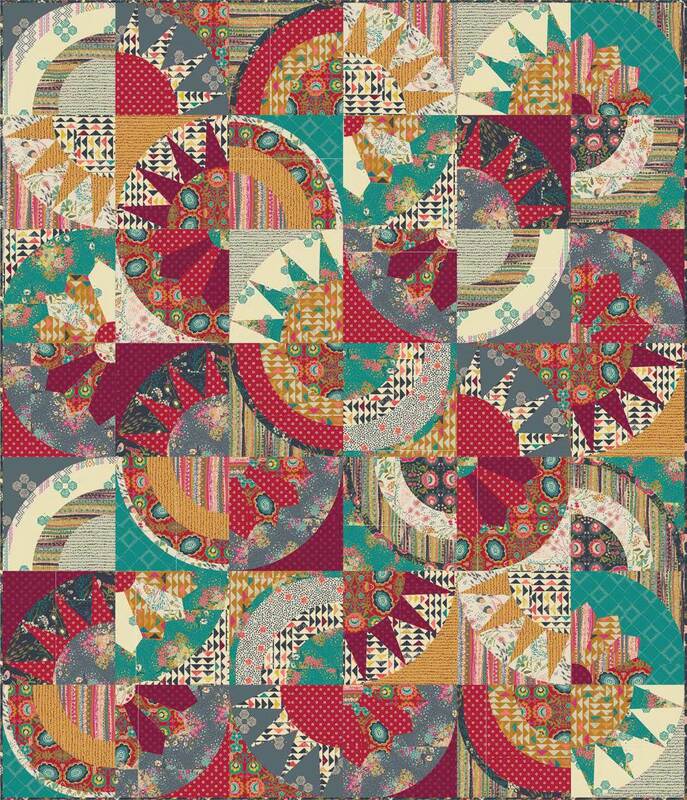 Our readers owe themselves a visit to Frieda's Friestyle website, where she offers vividly beautiful patterns for quilters. 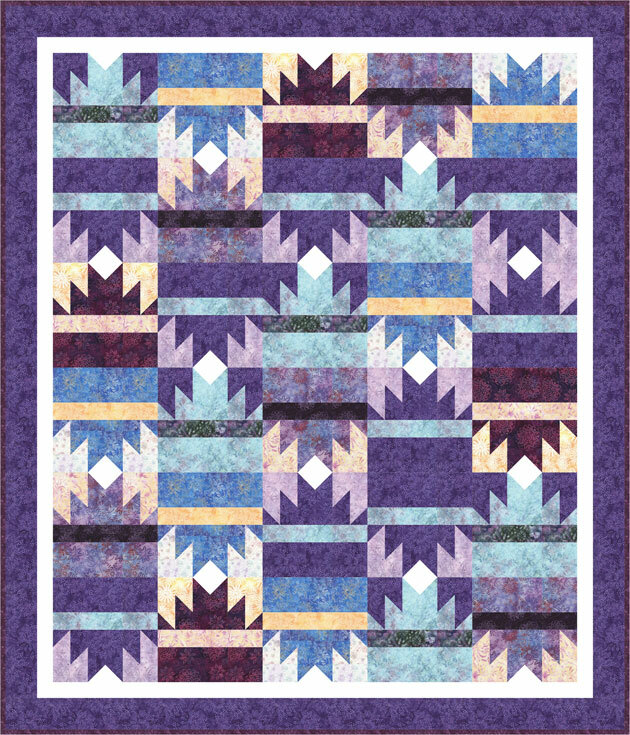 Right now, the Pumpkin and Petite Sunflowers patterns are on sale for an incredible $3.00 apiece -- what a bargain ! 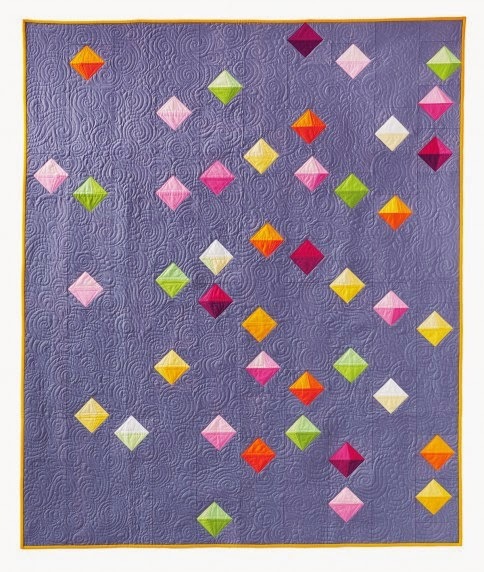 And, what's wonderful is that in addition to the pattern, Frieda sells her gorgeous fabric separately to make these quilts, so you can achieve the same luscious, luminescent effects that make Frieda's work so entrancing. 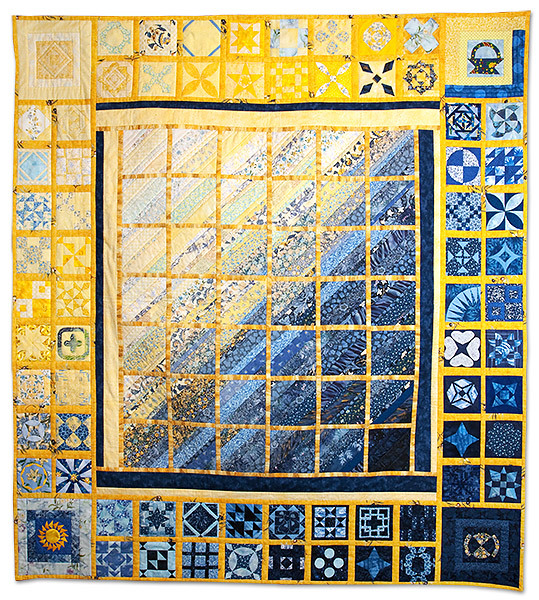 Fresh from the Pacific International Quilt Festival, held October 14-17 in Santa Clara, California, comes Ana Buzzalino's entry, "The Blue Door", a machine stitched, hand-stitched, and hand-painted work. 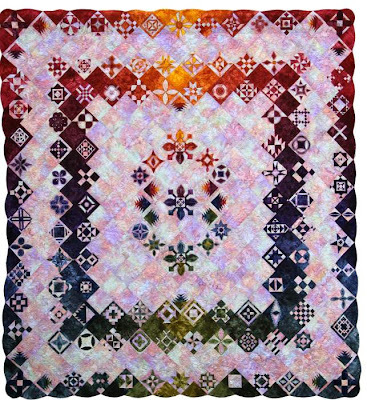 This is actually a wholecloth quilt, dyed with Procion dyes, which work on the fibers from the inside out, giving very intense and pure color to the fabric. Instead of providing a solid color fabric background for the still life display of pumpkins and pears, Ana used a photo of an old door to inspire her. 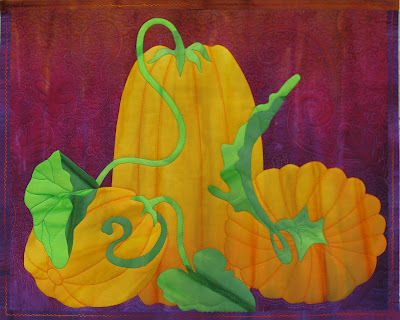 She painted and stitched the background so that it has a faded, lined, weathered look which contrasts with the vibrant pumpkin. 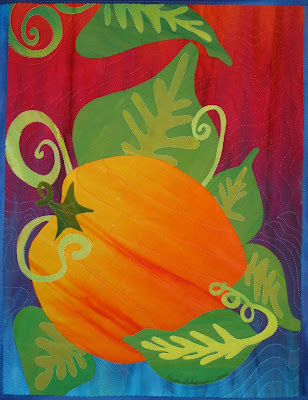 Ana explains, "The pumpkin and pears have been touched up with paint and color pencils to create depth and definition." 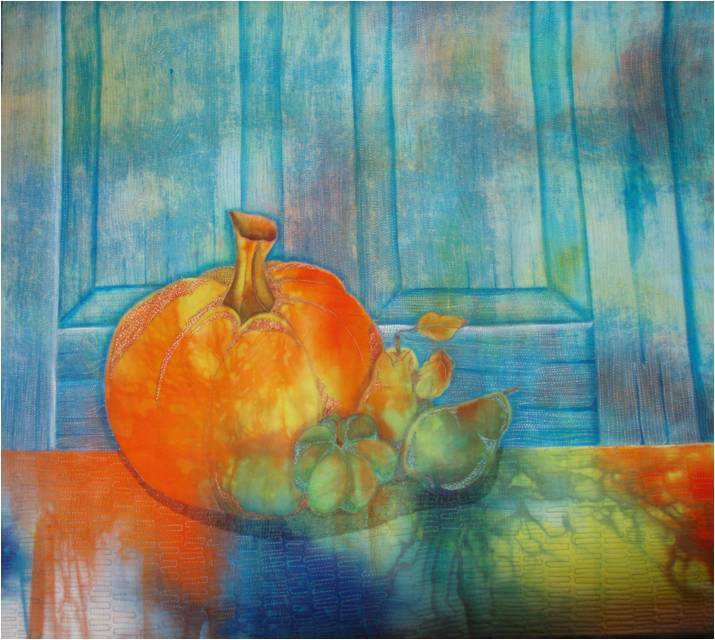 ﻿Ana achieves a very contemporary effect by allowing the bright orange, blue, and chartreuse dye to gently run off the surface that holds the pumpkins, thus enhancing the transparent effect of this work. 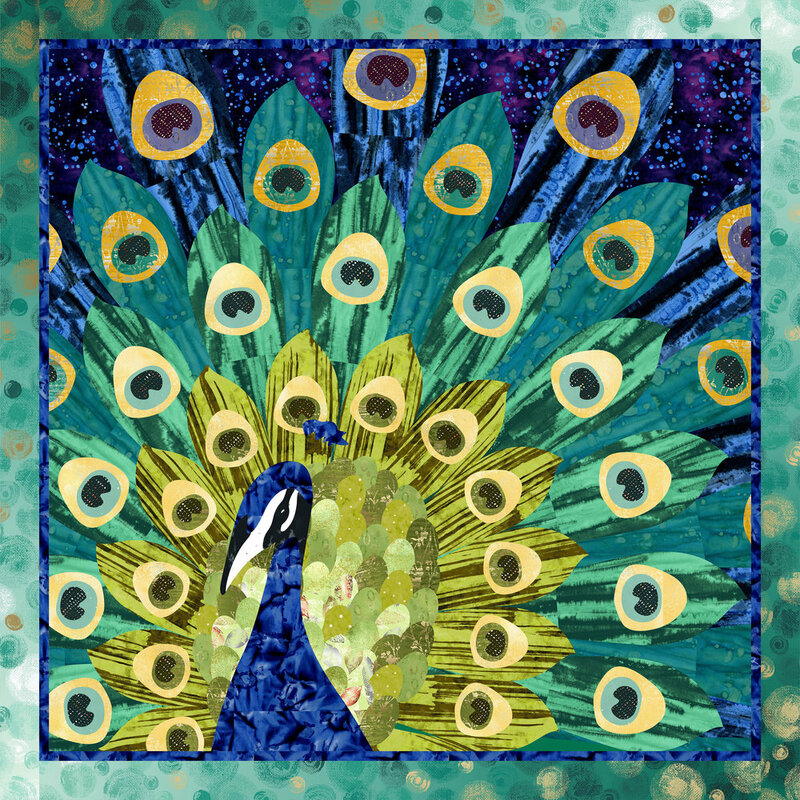 For more of Ana's captivating work, please visit her Patches and Paint website. Winners of the October Giveaway ! 3. 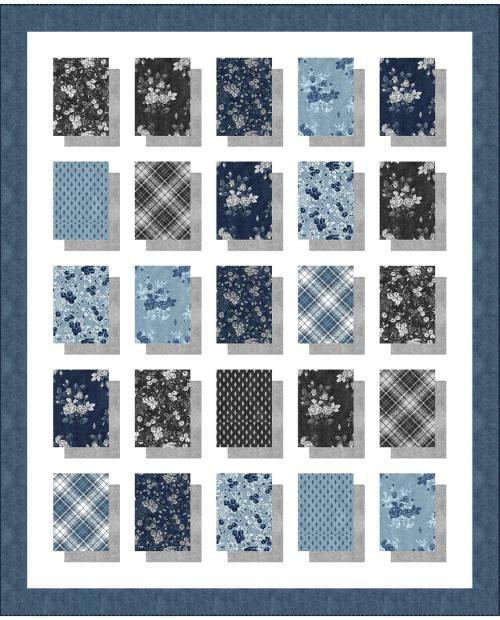 The winner of the second fabric assortment is White Stone. 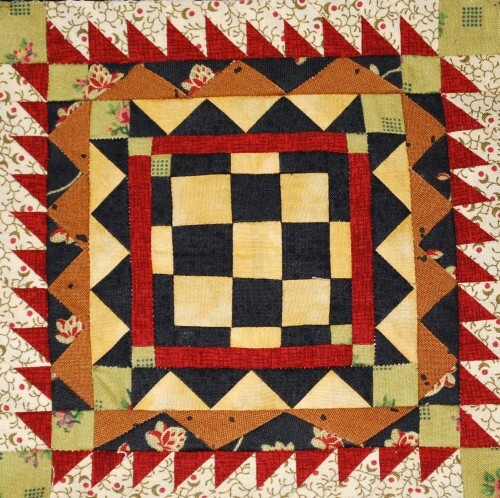 5.The winner of the "How To Make An Amish Quilt" book is Nancy Sue. 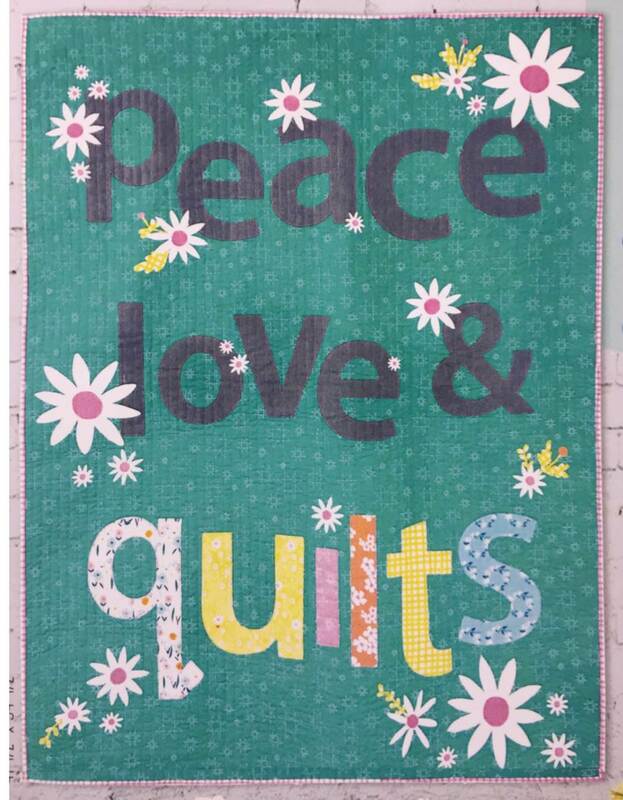 Winners, please e-mail us your name and shipping address ( which we will hold in confidence) to quiltinspiration@gmail.com .We'll ship out your prize, postage paid, as soon as possible. All of your comments were so lovely, that we really wish we could award a prize to each of you this month. However, we have the next best thing -- another Giveaway coming up as the holiday season approaches ! 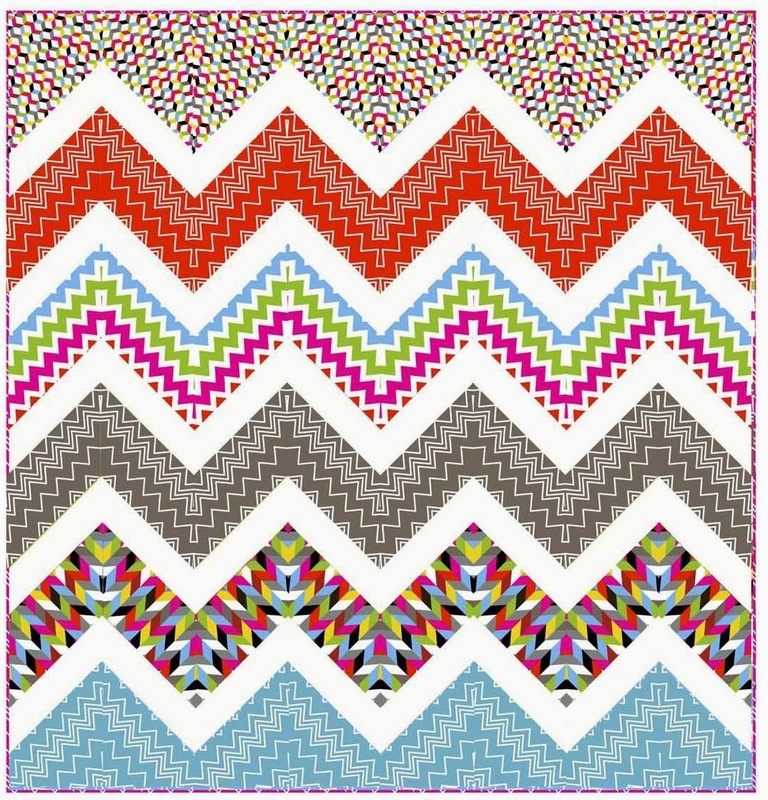 Please stay tuned for the Holiday Giveaway, which will feature beautiful, 2010 Moda fabric and more. 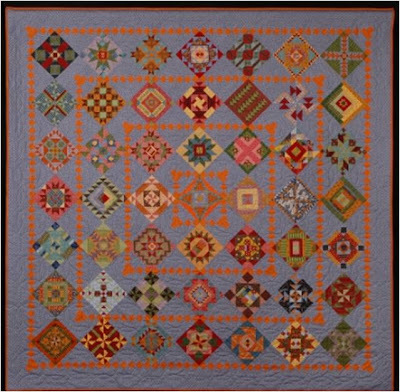 We're still crazy about two formidable sampler quilts: the 1863 quilt by Jane A. Blakely Stickle, and the 1870's quilt by Salinda W. Rupp. 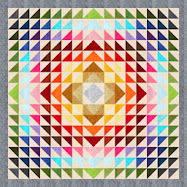 We admire the modern-day quilters who have tackled these epic works, while managing to retain (or regain) their sanity ! 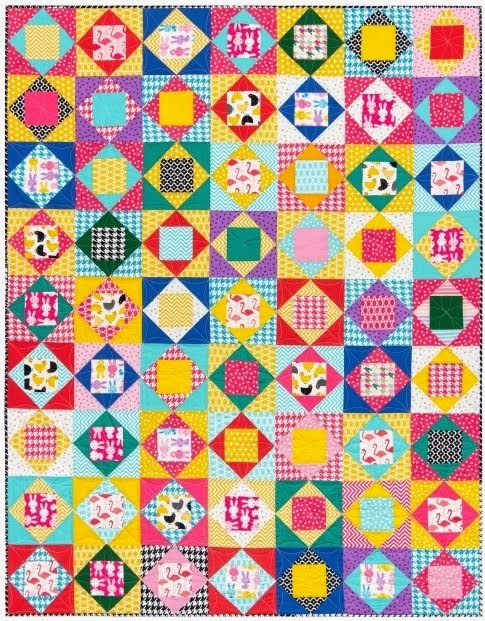 The Jane A. Stickle quilt was, of course, made famous by Brenda Papadakis, who coined the term Dear Jane® and chronicled each of its 225 blocks. 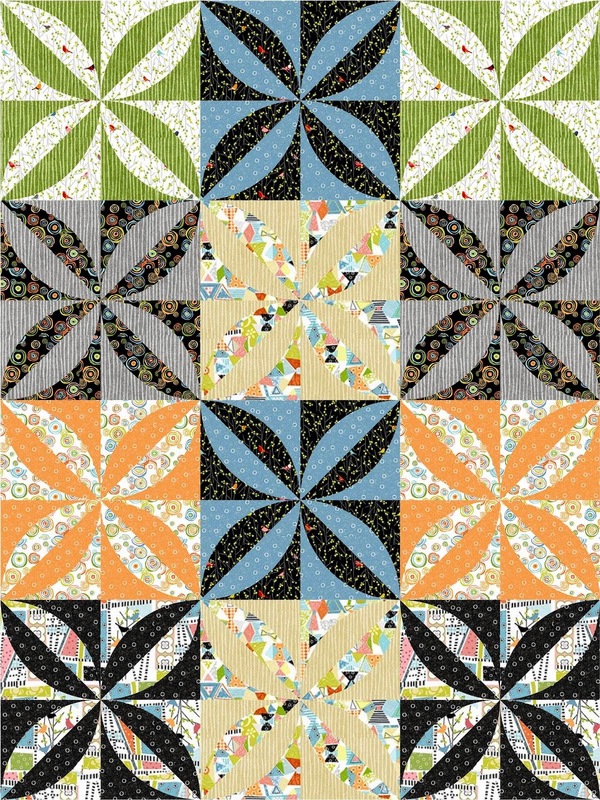 In a previous article called Crazy About Jane we featured some gorgeous name-appropriate quilts, including "Dear Jane's a Pain", "No Pain - No Jane", and "My Insanity". 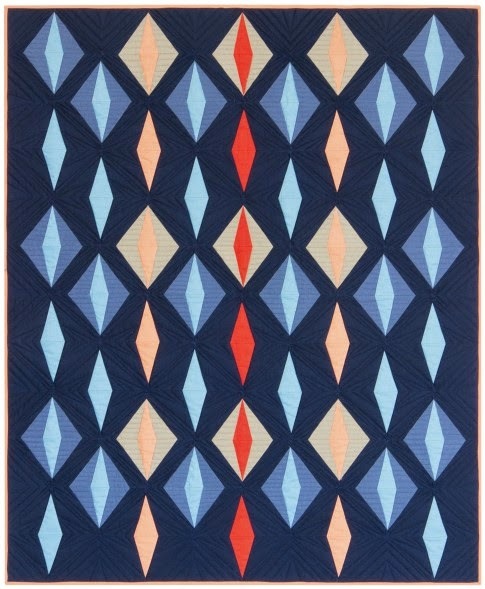 The Salinda W. Rupp quilt was brought to light by Liz Lois, who named it Nearly Insane. 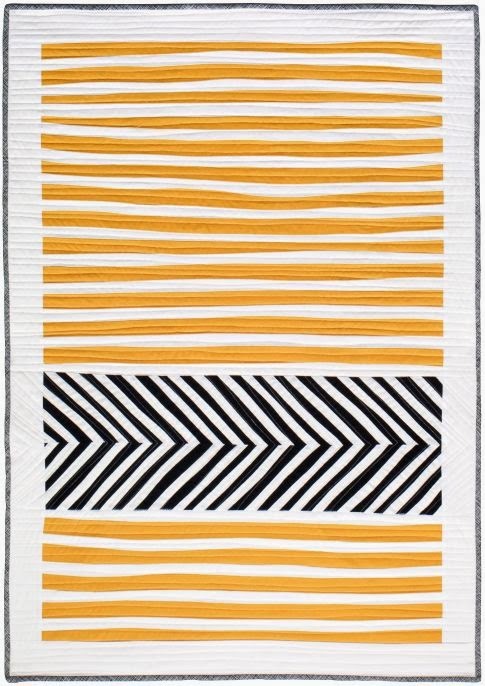 The Salinda quilt has 'only' 93 six-inch blocks, but the finished quilt has over 5,500 pieces, making it every bit as onerous as Jane Stickle's quilt. 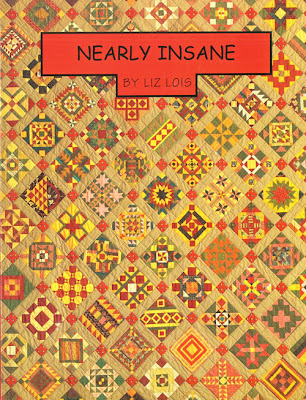 Hold on to your hat while we move from "Crazy About Jane" to "Nearly Insane", to "Just Plain Nuts". We've been admiring "Facets" for a long time. 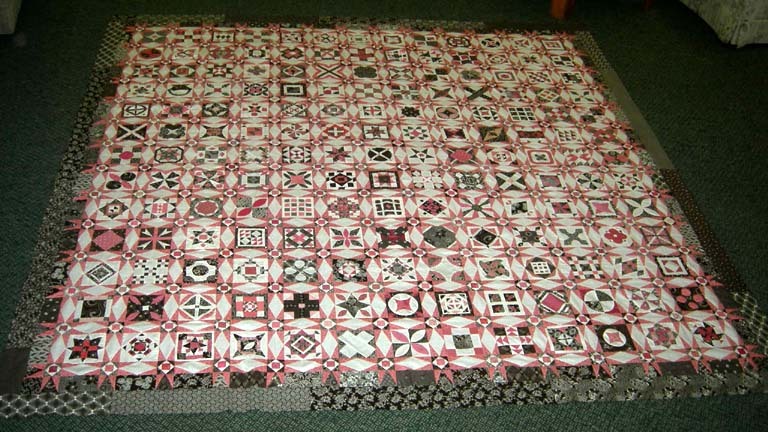 Marcie Thompson finished piecing the quilt in just under a year; that's more than one block every two days. You can read her story on the Facets page at the Blue Cat Creations. 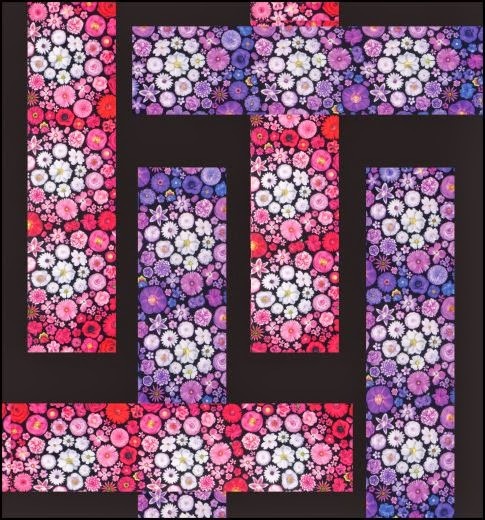 Marcie's quilts are show-stoppers; while you are visiting her site, check out her Conway Album and Calico Garden quilt pages. "Jeepers.....It's Jane!" 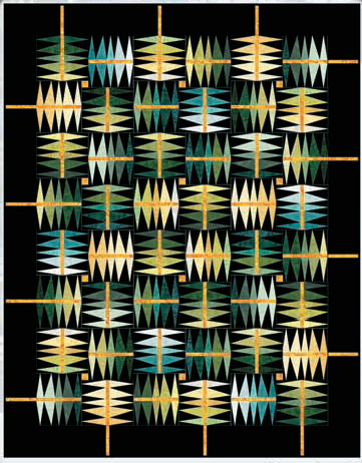 won the Viewer's Choice award at the National Quilting Association 2009 show, and a full page article was done on it in the Quilting Quarterly magazine. 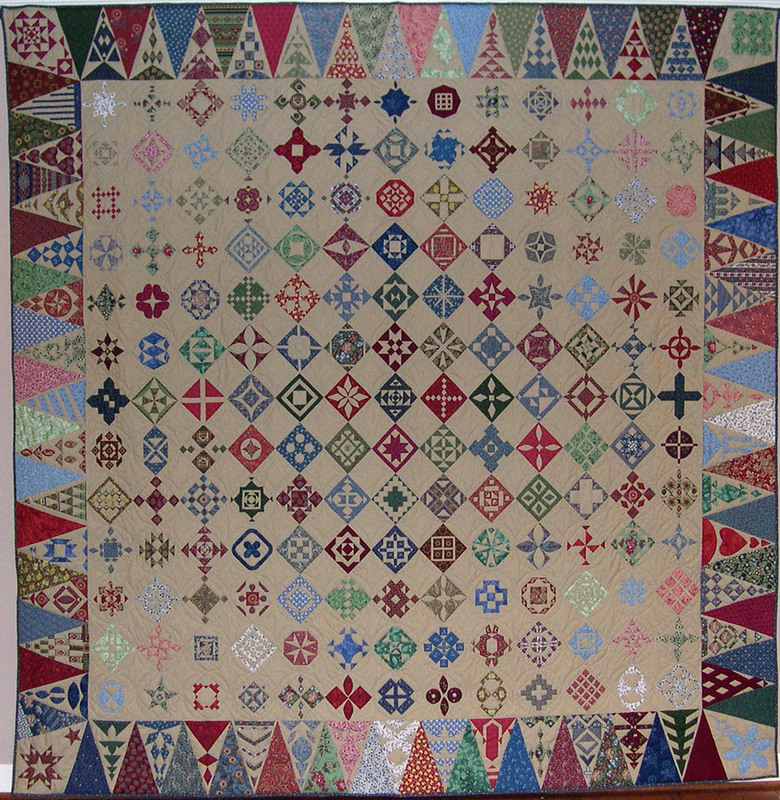 The quilt also won an award for "Best Interpretation of a Theme" at the 2009 Pacific International Quilt Festival. 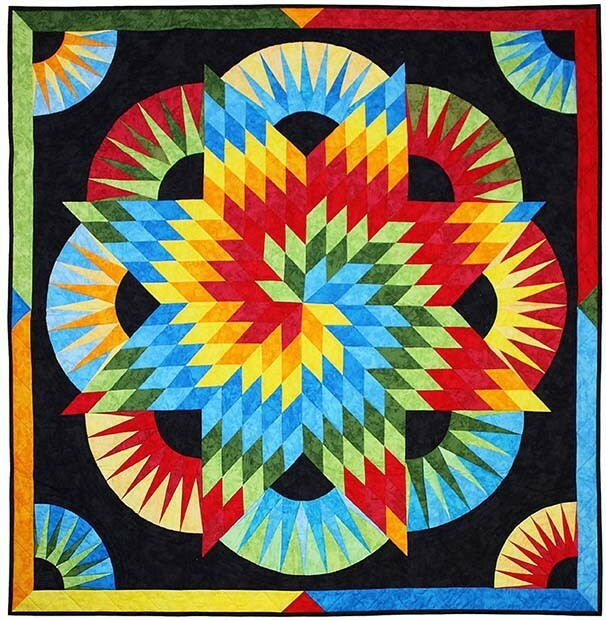 Jeepers, along with Beth Schillig's "Sunset Serenade", have been accepted in the Houston International Quilt Show next month ... if you are going to the show, you can see the quilts in person ! For more inspiration, visit Beth's online gallery. 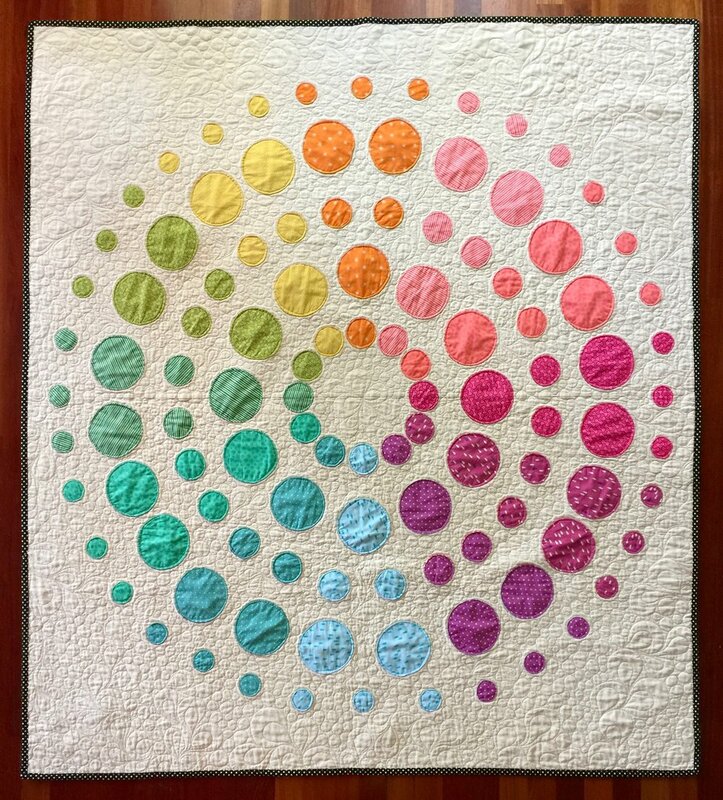 Lesley Thomas made her gorgeous "Jane, Past and Present" with batiks, set in Kona natural cotton as a background, with a trip-around-the-world design. 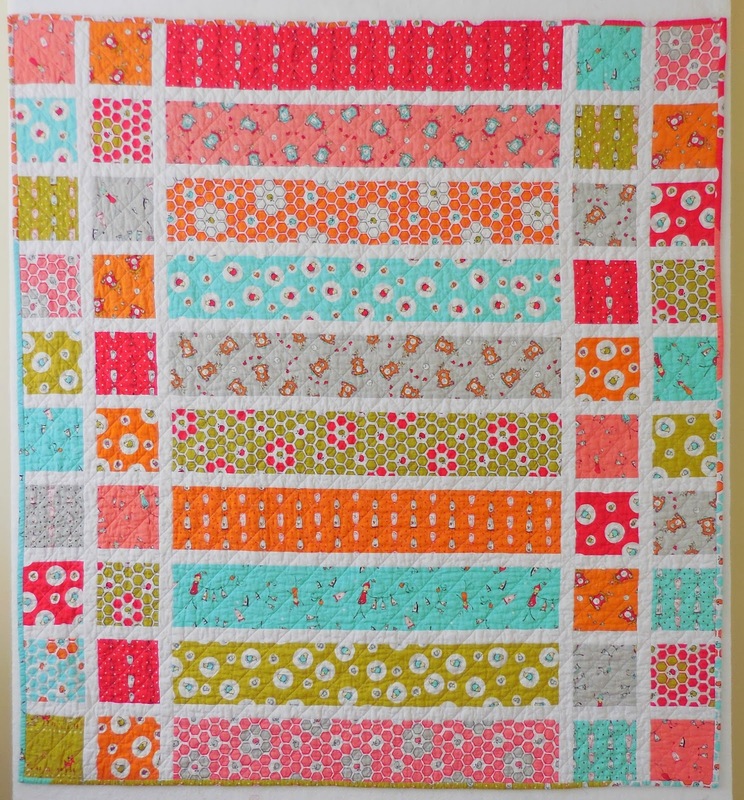 The quilt was made in 6 months, 22 days. 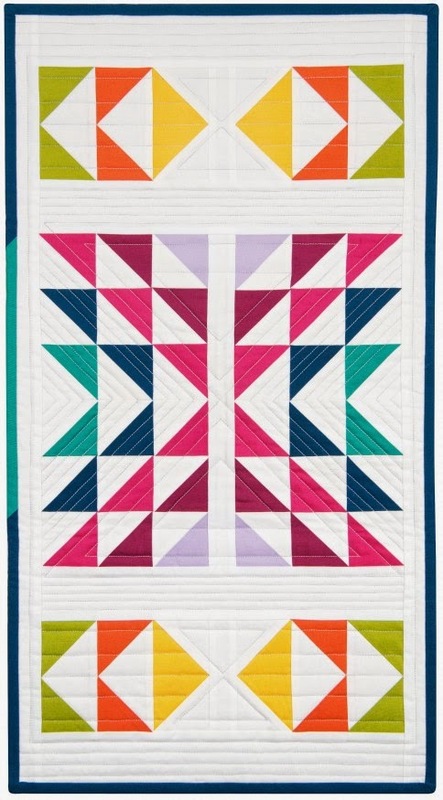 It is also hand quilted ! 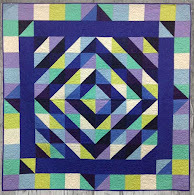 Lesley writes: "These little blocks (4-1/2 inch finished) really took me over, and I couldn't stop making them, so I ran ahead of the schedule and just kept going." 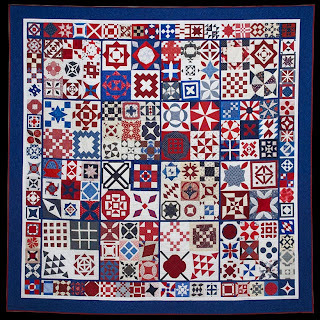 You can read a compete description of the quilt at the Quilting Board; and visit Lesley's website at Quilts in Ireland. 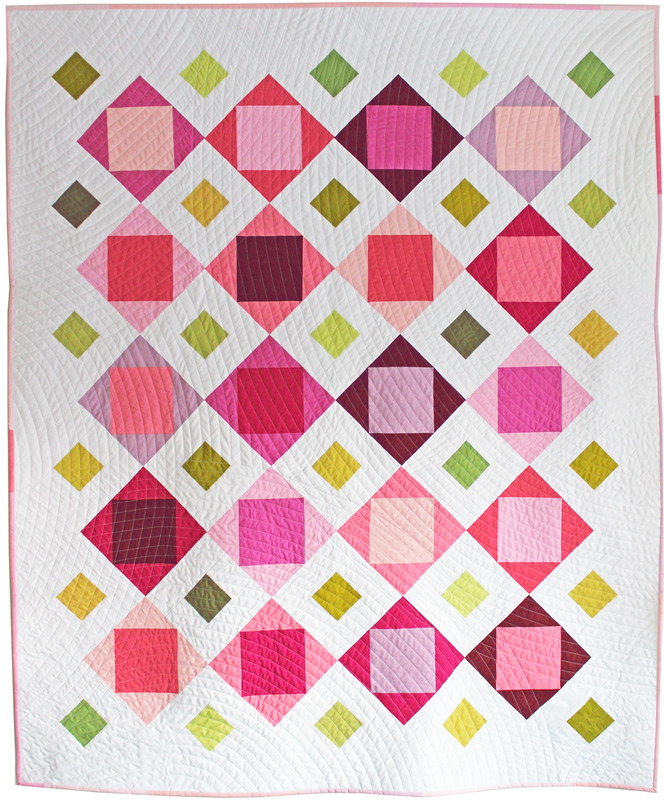 Many quilters have admired "In The Pink", and we couldn't resist showing it here. 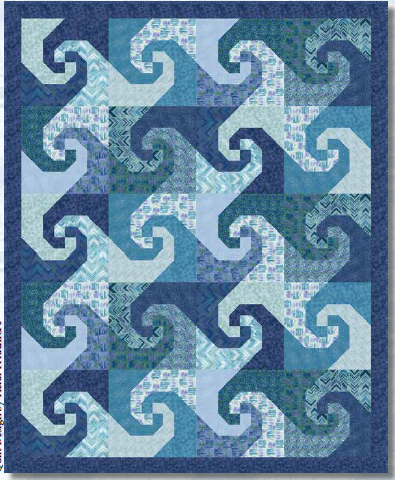 Who would have thought that storm-at-sea sashing would so beautifully complement the blocks? 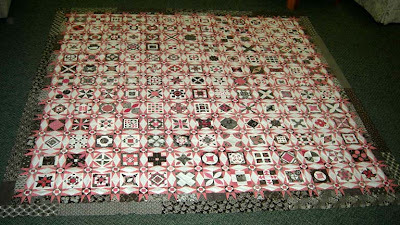 Read about the quilt on Bonnie Hunter's In The Pink page, and check out the photo of her hand quilting at her September 20, 2010 post; also see Bonnie's completed baby Jane, done in the traditional style. 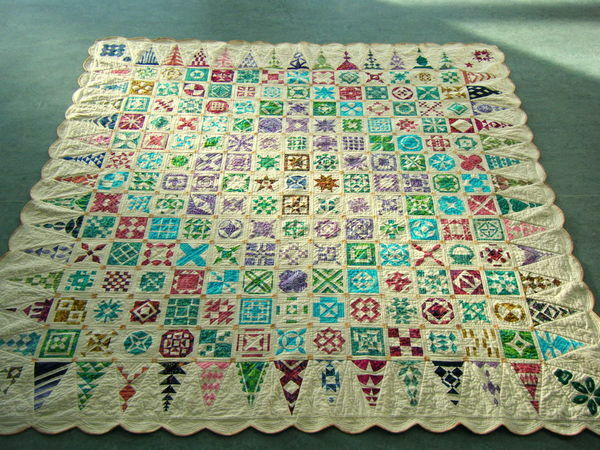 Over seventy-five members of the Monterey Peninsula Quilters Guild created their own baby Jane for their 2009 opportunity quilt. 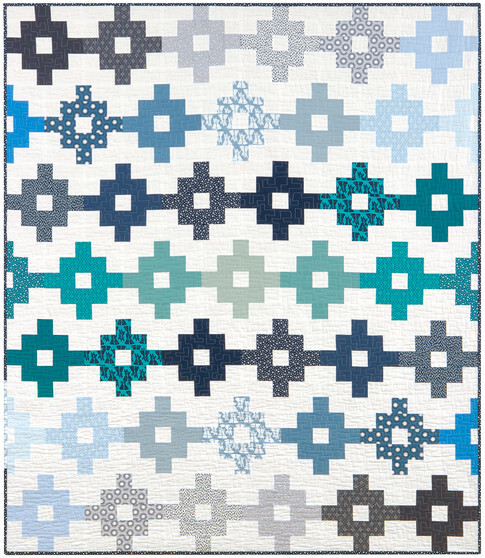 In this dazzler, 104 medium and large DJ blocks are combined in alternating square sets of 4 and 9 blocks. 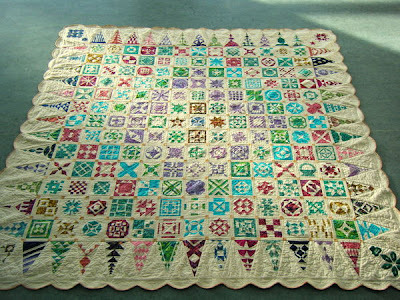 The center of the quilt surrounded by a continuous border of 68 small blocks, for a grand total of 172. 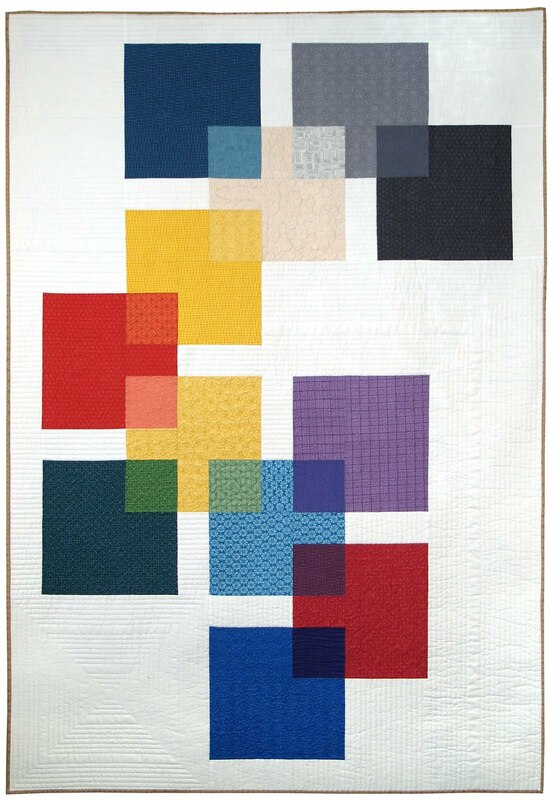 This is Pamela Leonard Wexler's second Dear Jane-inspired quilt. 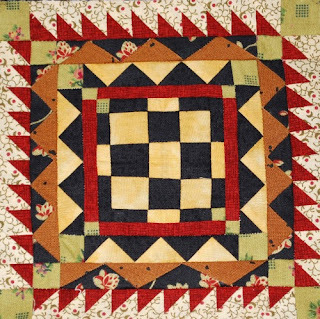 The center of the quilt was adapted from Mabeth Oxenrider*. Also see Pamela's delightful Jane Plays with Dolls and Jane and Hannah on the Savannah. 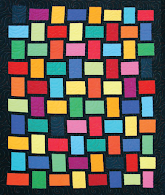 You can read about Pamela Leonard Wexler on the November 2004 Quilter-of-the-Month page. 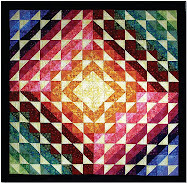 This striking quilt won a 2nd Prize ribbon at the 2009 Urban Inspirations Show. 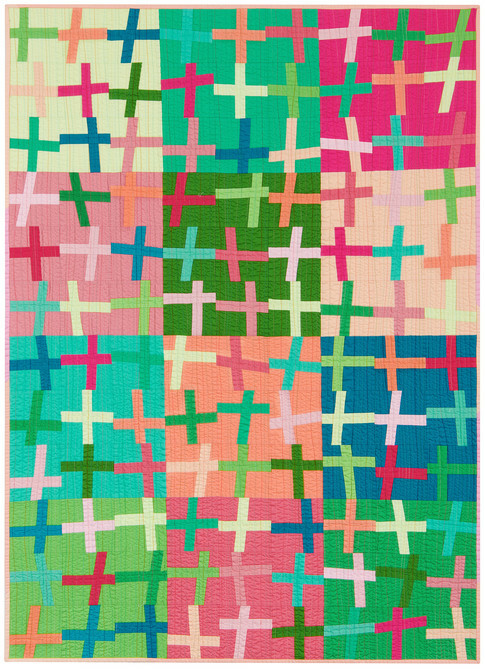 Anna writes that she took the "Awash With Color" and "Dear Jane" classes at The City Quilter, and combined the two into one quilt. 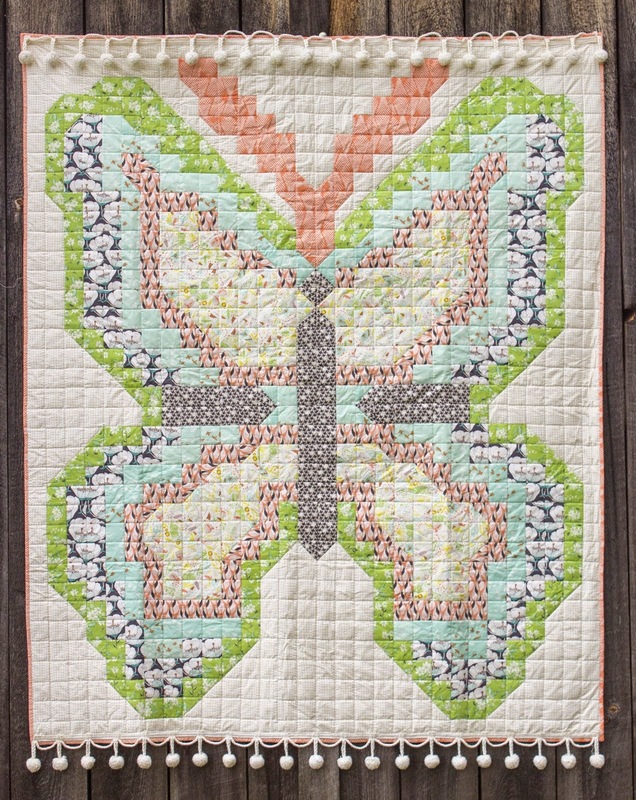 See more quilts by Anna Krassy on the April 2006 Quilter-of-the-Month page. Hanne Schneider inspires us with her creations from Norway, and her rendition of "Nearly Insane" is one of our favorites. 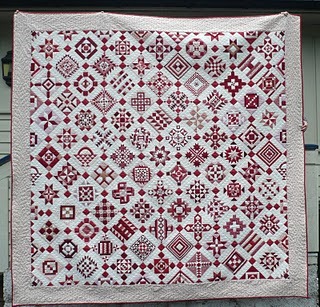 The pretty red-and-white colorway gives the whole quilt a crisp look; the blocks really stand out from the snowy white background as a result of the value contrast. Many of the blocks are incredibly detailed, as you can see from the NI block photos shown below. The block on the right is the one with 229 pieces; just look at the perfect piecing of the teensy triangles. 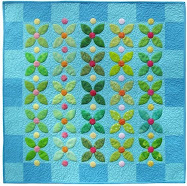 At Hanne's Quilt Corner, you can also see her delightful Dear Jane Christmas Quilt . This complicated NI block has 181 pieces. 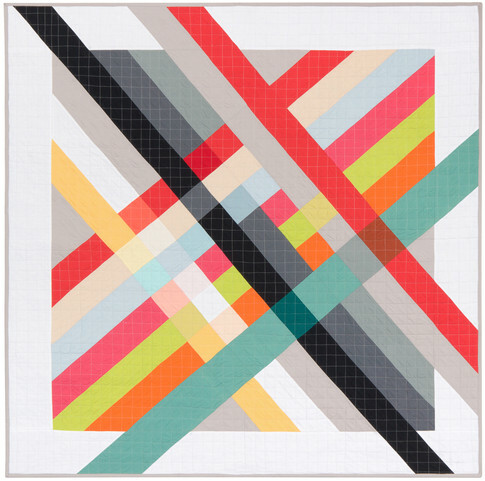 We love Pipers Girls' dynamic fabric selections, and they always inspire us with their quilts. 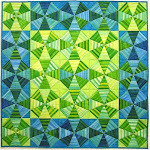 To read about this quilt and view more impressive blocks, see this Pipers Girls blog post and Flickr links within. 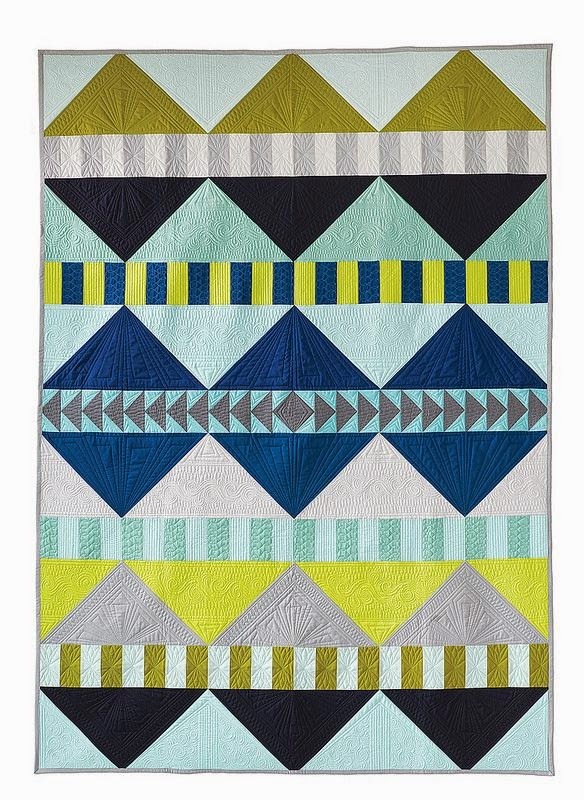 Also check out Pipers Quilts and their great Etsy shop. 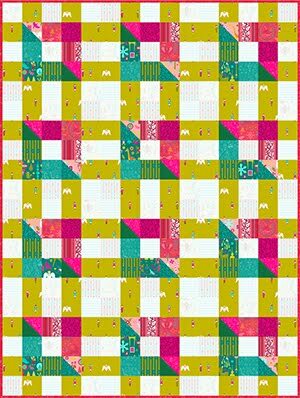 For her second book, Just Plain Nuts, Liz designed 49 colorful blocks in the style of Salinda Rupp, and set them together in a new way. 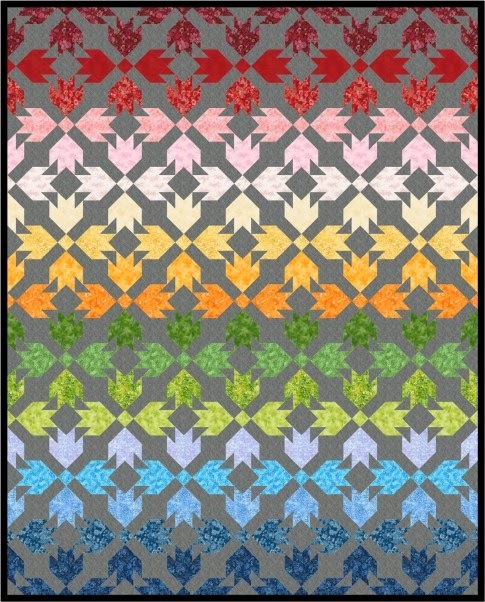 This quilt has about half as many blocks as the Salinda quilt, making it only half as insane ! 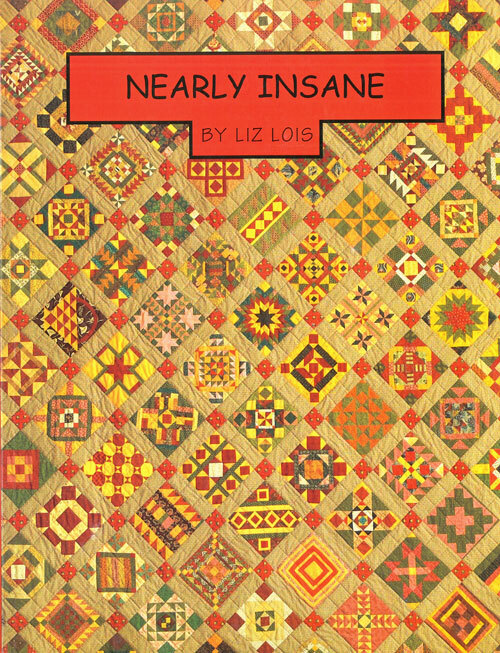 The Just Plain Nuts book can be obtained from many of the sources listed on Nearly Insane, and online from Piecing the Past and Quilted Treasures. 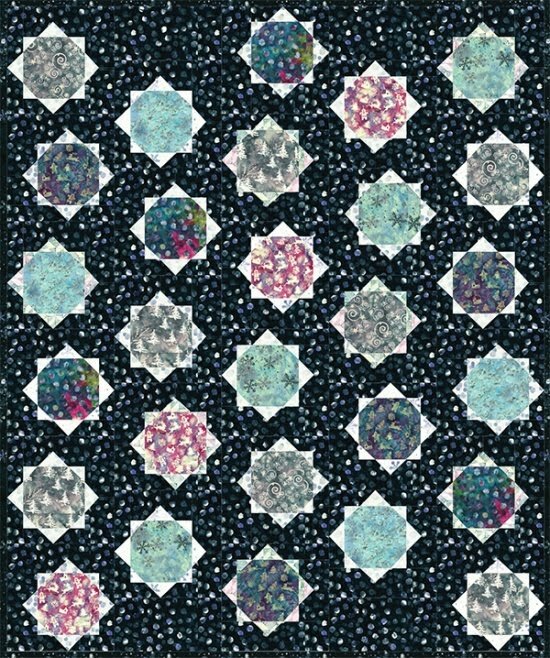 More Nearly Insane quilters: Nanayane at Nearly Insane in the Brain has fondly named each of the NI blocks; we are partial to "catatonia" (block 21) and "delirium" (block 18). 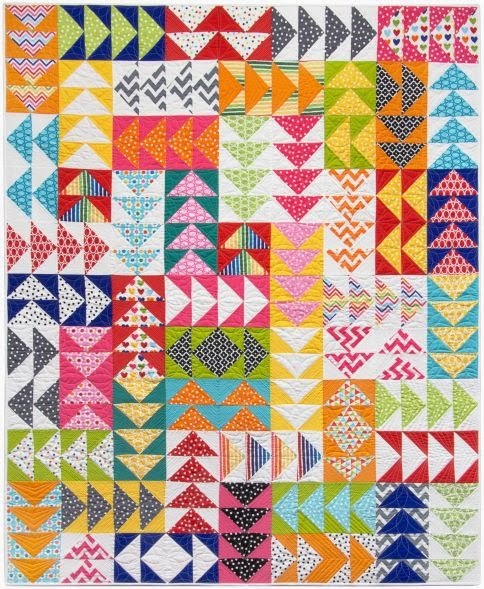 Also see the Nearly Insane Fans and Nearly Insane Quilts blogs, and a dozen finished NI quilts by the "Salinda Girls" at the Kilmore Quilters' Gallery (Australia). 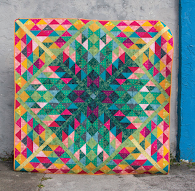 Don't miss the incredible photos by Reiko at Reiko Quilt (Japan). 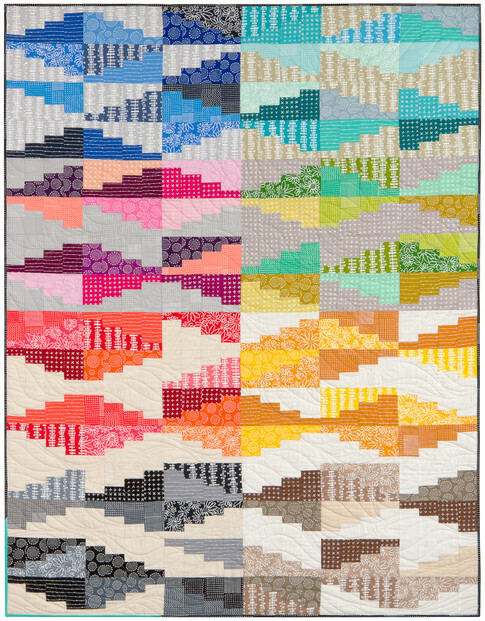 And last but not least: a Nearly Insane quilt, named Bewitched, Bothered and Bewindered, won First Place in the "Pieced, Amateur" category at the 19th annual IHQS show. 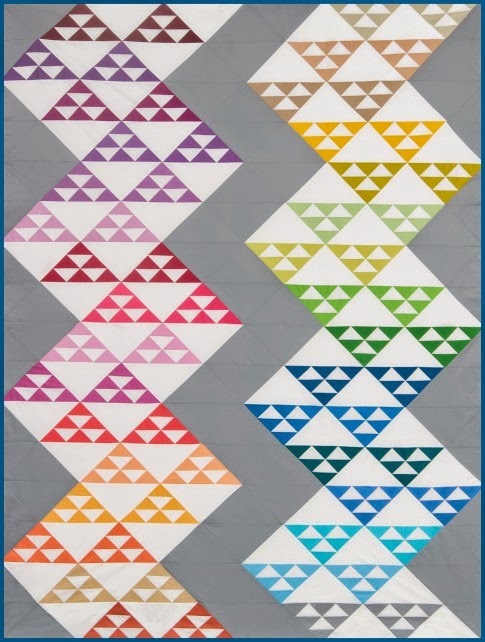 This raises two questions: if you complete a Nearly Insane quilt, can you still qualify as an amateur? And, what is the meaning of "bewindered" ? Image credits: Quilt images are shown with the generous permission of the artists and the Empire Quilters Guild. Dear Jane® is the registered trademark of Brenda Papadakis and is used with permission. 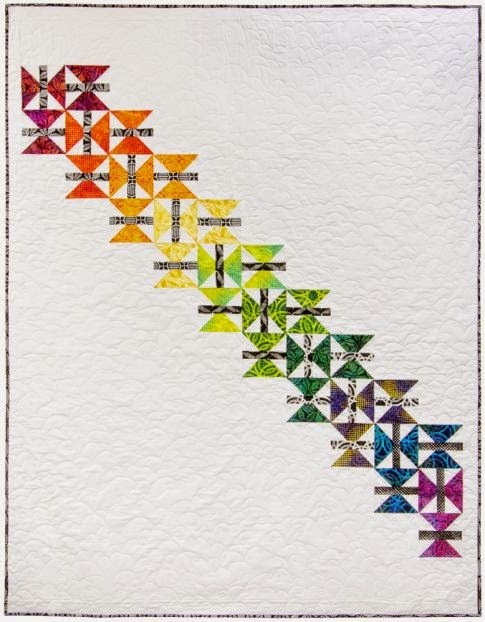 Footnote: *See "Trail Mix" by Mabeth Oxenreider at American Patchwork and Quilting.